We begin with the clear assumptions that cities need to be inclusive. In a landscape where market forces control all housing production, we believe that an inclusive housing policy needs to extract a stock of units from the speculative market to be made available to vulnerable households at protected, below market rates. Our investigation of Al-Mahaba Building indicates that the building provides an exciting opportunity to experiment with this process, through the establishment of a resident-led cooperative that owns and manages the building, improving dwellers’ control of their living environment. However, this is not a replacement to the power of the speculative market, which only equitable housing policies can control. Tarik el-Jdideh (TJ) is a mixed-use, middle and lower class neighborhood. It is considered one of the densest areas in municipal Beirut and is affected by a high degree of eviction particularly for old-rent tenants (Bekdache, Basbous, and Saksouk, 2017). In line with other neighborhoods of Beirut, developers are targeting old buildings with demolition and replacement, increasing the instability of the most vulnerable social groups. It is worth pointing out that these developers are exclusively from one specific political affiliation and while they present themselves as “from the area,” the simultaneously cause havoc to the same communities for which they pledge belonging. Al-Mahaba apartment building (Parcel 1853) dates back to 1964, is eight stories tall and includes 4 apartments per floor, except for of the last floor that only counts 2 apartments. Six apartments in the building still benefit from old rent-control. Given that these occupants are financially incapable of purchasing their apartments, the apartments were sold to new owners without their knowledge. As a result, the threat of eviction is very high, particularly because new property claimants and developers have obscured the protections given to old-rent tenants under the new legislation (Article 58/2017, revision to the 2014 rent law) as a tactic to facilitate eviction. Youssef Hable, the developer, sold three apartments (on the first, fourth and sixth floors) simultaneously to two different individuals through contracts at the notary public, (عقد بيع مسموح) without recording transactions in the land registry. Seven Palestinian property owners see their homeownership threatened because the 2001 property law prevents them from bequeathing or purchasing property. To “own” a home, they are forced to register the property in the name of a Lebanese relative or friend. Property records indicate that recent property transactions weren’t registered in the official registry. In total, ten apartments rely on a contract at the Notary’s Conflicts (عقد بيع ممسوح) among heirs of the original property owners, developers, and buyers make it impossible to record transactions officially. While perhaps fair to the buyers, a legal settlement and clarification of ownership is likely to trigger a new wave of evictions. The final decision over property ownership is likely to be swayed by political rivalry between local representatives of the dominant Future Movement (Al Dana and Berjawi families) which renders non-political members of the Berjawi vulnerable to eviction. The building’s physical conditions are deteriorated due to lack of maintenance. Common spaces are blocked (e.g., water tanks). The building is also inaccessible to wheelchair users because of the narrow elevator (1x1m) and the absence of a ramp. Although it keeps the apartments at a lower market price, the poor building quality interferes with everyday livability. Six apartments house elderly residents, sick residents, and a person with a disability. These residents are frequently confined to their apartments, mainly due to poor accessibility and the absence of open spaces in the neighborhood. Almost half the apartments violate building regulations by adding rooms, which reflects the need for additional spaces. The tag of “illegality” is a double edge sword: criminalization but lowered property value make residential units more affordable. A building committee was formed to confront the deterioration of the building’s physical conditions. It is unclear whether the committee meets official legal requirements, nevertheless, the organization is an effective vessel for mobilization. Committee members are currently trying to reclaim the building’s shared spaces by buying back the concierge room. We propose to transform the building into a housing cooperative. Also, we propose a design intervention to expand the building and improve its conditions. A housing cooperative is a non-profit, legal entity with unlimited capital that owns real-estate shares to provide affordable housing to its residents. It operates on a membership basis, sold through shares that represent the right to occupy housing in the building. Shares are usually proportional to the value of the apartment (size, specifications) but only one vote is issued to each resident regardless of shares. This framework dissolves political power through equal voting rights. A monthly fee could be charged to residents for maintenance and operation. Housing cooperatives are usually run by a board of residents that manages and operates the building and sets the rules for membership. In our case, the building committee forms an interesting seed for a coop (A cooperative for Professionals in Lebanon, 2012). (1) Coops dissolve issues of conflicting property ownership, transforming all claims into shares. (2) Coops provide cheaper housing due to tax breaks and fee exemptions. (3) Coops could finance and maintain building quality. (2) Ensure accessibility for wheelchair users. (3) Add two new floors, as allowed by current exploitation, and add residential units and commercial spaces for NGOs –particularly elderly care since there is a significant percentage of old residents. In the long term, this investment would provide financing for the cooperative and subsidize its prices. We used the Lebanese building law (646/2004) to calculate the maximum possible exploitation (see Table 2). The current exploitation is 1,344m2 (occupancy table). Based on the drawing plans provided of each floor (Public Works), we estimated the construction of unpermitted additions to 440m2 . We accounted for illegal additions and found it possible to integrate additions within existing permitted areas, build two new floors, and remain within “regularizable” conditions. (3) Fund from Article 17 of the revised 2014 rent law, which allocates a fund for vulnerable old-rent tenants who earn less than 5 times the Lebanese minimum wage. (1) The Beirut Municipality’s earmarked spending on charitable causes. (3) Religious institutions such as Dar al Fatwa’s Zakat fund (may be inapplicable elsewhere). The social and economic feasibility of our intervention took into consideration the scenario that the Coop is established in the building and will be scaled up to include additional housing unit the neighborhood, thus achieving its main objectives of affordable and equitable housing. Thirteen apartments will be bought by the Coop (888 sqm), including commercial spaces on the ground floor (4 units, 1,030 sqm). Based on our calculations, the two extra floors will cost USD 100,000 (Table 4). Every single inhabitant of the building will be a member of the Coop, but not all apartments will be purchased by the Coop, only the apartments with the most vulnerable tenants. To insure fairness, current residents who did not sell us their apartments but became part of the Coop are exempted from fees (see table 7 and 8). Taking the median price paid by owners in the last period for the sqm of the residential and commercial unit, we estimated that it would cost $1,030,000 to buy the apartments and the commercial space. Depending on the source of financing, we could expect to buy the apartments for the cooperative, break even in maximum 15 years, and fund more housing cooperatives (table 8 and figure 2). Given that similar challenges (e.g. 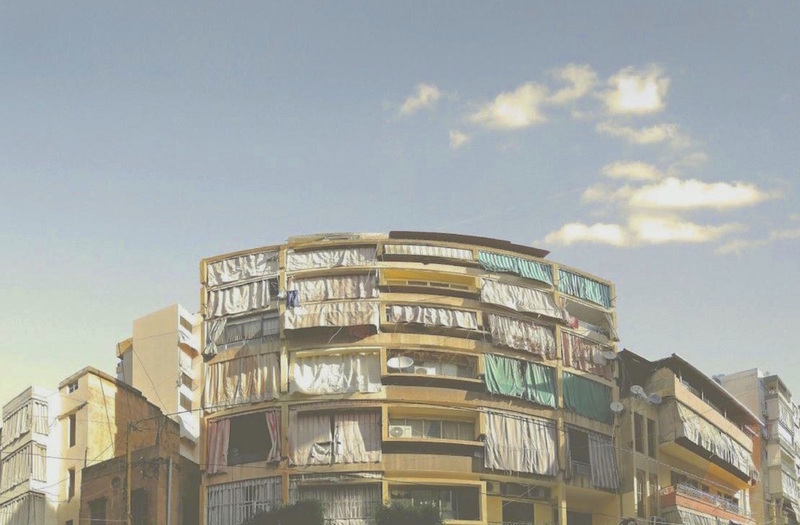 ownership, multiple heirs, illegal construction, old rent, power relations, and building quality) exist almost everywhere in Beirut, we believe the approach to be replicable in other areas. Of 54 surveyed buildings, 31 reported conflicts over inheritance leading to demolition, 5 reported no inheritance concerns and the rest refrained from responding (Map 2). Housing is a right. This is recognized by Lebanese Law (Housing Law 58/1965). It cannot fall prey to power games where the most vulnerable are evicted. The challenges mapped in TJ apply elsewhere in the country, and in many ways, our proposed solution could be a first step in de- commodifying shelter.